Livi has a small bowl at 4' deep with transition into a big bowl at 8' deep. 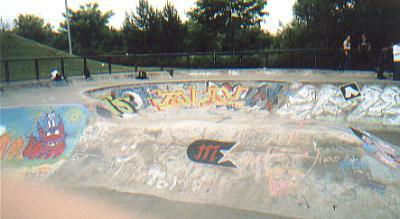 It also boasts a half-pipe at the same depth as the big bowl and 22 feet long with quite an easy roll-in at one end, at the other end it opens into a wide reservoir where the bowls are at one side and at the other is an extension. The extension is about 30 or so feet along and probably about the same in width. With two bowl shaped bits at the far end which the locals call the (sun and moon) separated by a small hip. The hip also acts as a roll in for the funbox down the middle of the extension and also the mole-hill at the very end of the extension. The extension also has a double drop-in to the reservoir at both sides with one directed straight through the reservoir towards the bowls, the other aimed side on towards the mole-hill. 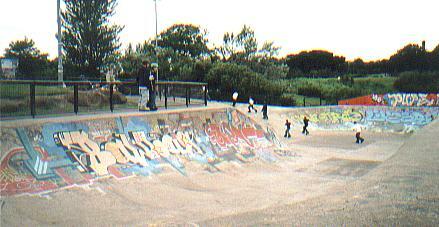 The local skaters at this skatepark include: Ben Layden, Stuart Graham, and a whole bunch of up and coming new talent. Kenny Olmond is the main man responsible for there being a park here, he's a man who's fought harder than most to make sure we have somewhere to skate. Kenny and his son Ivan can also be seen skating here. Kenny also works hard to organize the skate parties and competitions in this area. He is a true veteran of the skatepark. If you're driving there's signs you can follow to get to Almondvale Centre. On your right-hand side you should have... McDonalds, then Safeway, after them you'll come to a roundabout, take a left down a small hill. You should see a nightclub (Club Earth) turn in at the first turn-in after the club, just before the road lights.